(Seht die Sonne is) a weighty but emotionally direct masterpiece (...). Antikt klotter sätts i körverket Graffiti till musik med arkaiska och senromantiska drag. Förstklassigt utförande även av det virtuosa orkesterhantverket i Seht die Sonne. Packende Aufnahme (...). Herausragende Klangregie ist man von einem wie Lindberg gewohnt (...) Aber auch die Aufnahmetechnik und vor allem die Interpreten tragen zu diesem absolut überzeugenden Klangereignis bei. Graffiti is as intelligent as it is beautiful, appealing, and exciting (...). Seht die Sonne (...) is an absolutely bewitching piece of orchestral writing. (...) The performances are vivid, even thrilling, the engineering outstandingly lifelike and (...) well-balanced. Hot stuff! "Seht die Sonne" (...) is as massive and solidly built as anything else in Lindberg's catalog. What's different is the melodic grace of the writing and the gleaming transparency of the orchestral textures, beautifully rendered by the Finnish Radio Symphony Orchestra under conductor Sakari Oramo. The orchestra under Sakari Oramo is a treasure trove of colour. In der Tat: Magnus Lindberg ist als Komponist ein wahrer Virtuose. Magnus Lindberg nous montre encore que l'orchestre est toujours une source d'inspiration sans commune mesure! Seht die Sonne on (..) jälleen yksi fantastinen retki tuntemattomaan (...). Sakari Oramo ja RSO sytyttävät Lindbergin partituurin liekkeihin kkuin orkestraalisen merkkitulen. Oramo and his Helsinki forces give both works terrific performances. Two of Magnus Lindberg's recent works, among the most substantial that he has composed to date, make a logical pairing. Taken together they show how effective his recent style is in creating large-scale musical structures. Lindberg's conviction, and technical resourcefulness, in creating this sound world can inspire rapturous enjoyment or alienated bafflement (...). The effect is always upbeat, exuberant and laid down with immense panache by the Finnish forces involved, in spectacularly vivid sound. Magnus Lindberg is widely recognized as one of the top composers of our time. He currently serves as the New York Philharmonic's Composer-in-Residence. The present recording of GRAFFITI earned Lindberg a 2010 GRAMMY award nomination for Best Classical Contemporary Composition. This recording showcases his famed skills as an orchestral composer. Seht die Sonne ("Behold the Sun"; 2007) borrows its title from the final chorus in Schoenberg's Gurrelieder; it is an ideal example of his recent, more approachable style. 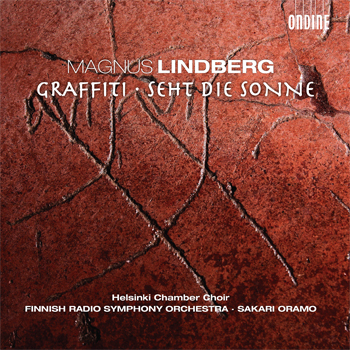 GRAFFITI (2009) is Magnus Lindberg's first large-scale choral work with orchestra, which earned him the 2009 Finnish Composer Society's Award. The sung texts (performed by the Helsinki Chamber Choir) are a selection of 2000-year-old Latin graffiti inscriptions from the walls of excavated Pompeii houses. Their themes cover a range of aspects of domestic, political or civic life, including even some graphic language. International performances of this vital music (with hints of Stravinsky, Britten and Orff) have been received with great public and critical acclaim. Sakari Oramo and the Finnish Radio Symphony Orchestra are experienced champions of their compatriot's music; their recording of Sculpture, Campana in aria and Concerto for orchestra (ODE 1124-2) was listed by the New York Times among a selection of the 22 most notable recordings of 2008. The recording of Clarinet Concerto (ODE 1038-2) won best contemporary / première recording at both the Gramophone Awards and the BBC Music Magazine Awards in 2006. Click here for an interview by David Allenby with Magnus Lindberg on GRAFFITI, courtesy Boosey & Hawkes; for an interview with Daniel Jaffé / BBC Music Magazine May 2010 about how Pompeii inspired his composition of GRAFFITI, click here.